The Resurrection: Beating Death on the Cross. Holy Trinity Chapel. We glorify You and fall down before You, for You arose from the tomb, our only God. I will recount Your wonders. The teaching of deification or theosis in Eastern Orthodoxy and much of Eastern Catholicism refers to the attainment of likeness of God, union with God or reconciliation with God. Ladder of Divine Ascent icon St. Catherine’s Monastery Egypt, 12th century. Monks ascending the ladder to Jesus, led by S. John Climacus. Theosis is the mystery where He makes divinity our own. It is the movement toward communion with the divine. St. John Paul II said Catholics should be familiar with “the venerable and ancient tradition of the Eastern Churches”. “…the teaching of the Cappadocian Fathers on divinization (which) passed into the tradition of all the Eastern Churches and is part of their common heritage. This can be summarized in the thought already expressed by Saint Irenaeus at the end of the second century: God passed into man so that man might pass over to God. Lex Orandi, Lex Credendi means “the way you pray determines what you believe.” It was first used by Prosper of Aquitaine. Also, St. Basil the Great described man as the creature who has received the order to become a god. Jesus frequently went to Gethsemane with His disciples to pray (John 18:2). “The Orthodox Church understands theosis as a union with the energies of God and not with the essence of God which always remains hidden and unknown. However, the experience of the Church testifies that this is a true union with God. Tree of Life. 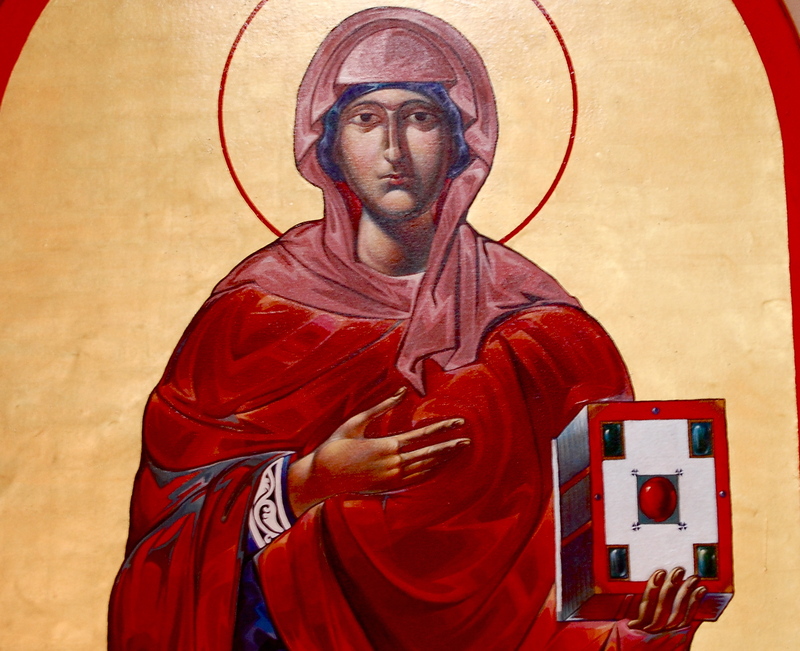 This Orthodox icon first appeared in the 15th century. The twelve shoots of branches are the Apostles. Theosis, therefore, is our union with the energies of God. To you be glory forever! The Three Holy Hierarchs. Author unknown. The Three Holy Hierarchs; St. Basil the Great, St. John Chrysostom, St. Gregory the Theologian, are giants in Eastern Christianity. St. Gregory the Theologian is known for purity and profundity of his language, St. Basil for his understanding of the Holy Spirit and St. John Chrysostom for his elegant homilies. They all lived in the east, near Cappadocia (Turkey) at the same time in the 4th century. All three Eastern Church Fathers have their feast day in January. In the Roman Catholic west, they are Doctors of the Church. January 30 is feast of the Three Holy Hierarchs. St. Basil the Great is a powerhouse in Eastern Christianity. In Basil’s family of ten siblings, five became saints as well as his grandmother, St. Macrina and his mother, St. Emellia. Basil went to Egypt and learned from ascetic hermits, who lived in caves, in the monastic way of life. Basil returned to his home in Cappadocia living as a monk in a small community, dividing his time between prayer, meditation on the bible and manual labor. Basil believed that when one is living with others in a monastery, the grace bestowed on each individual becomes the common possession of the group. An academia priest from Temple University told our congregation that St. Basil created the Glory Be to The Father prayer, one of the most widely said prayers in history. Many people are unaware that Basil created this prayer. More here. Pope Francis has always identified with Basil’s teachings. St. Basil the Great was quoted by Pope Francis in the LaudatoSi encyclical,“If the world has a beginning … we must inquire who gave it this beginning, who was its Creator”. 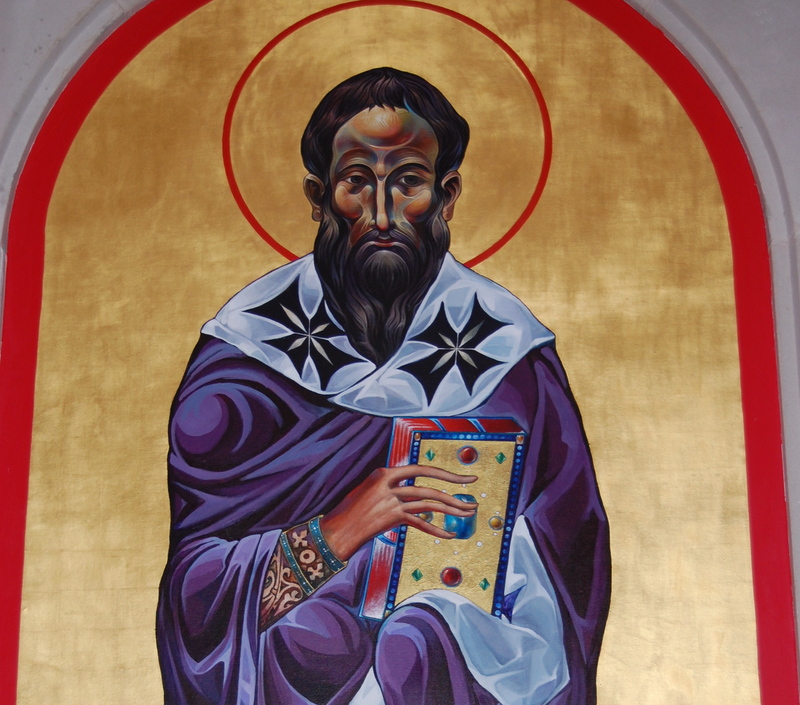 “Silence is the beginning of purifying the soul.” This Saint Basil the Great icon is an original, written by the famous Georgian iconographer Niko Chocheli from the former Soviet Union, in St. Basil the Great Church Chapel, Kimberton PA.
Well after his death, the Council of Chalcedon described Basil as “the great Basil, minister of grace who has expounded the truth to the whole earth”, thereby giving him the name Basil the Great! St. Ephraim the Syrian was a clairvoyant who actually met St. Basil. In a vision he saw a pillar of flame to heaven and a voice, “Such is the Great Basil!” Ephraim is also “The greatest poet of the patristic age and perhaps the only theologian/poet to rank beside Dante” – per Murray. St. John Chrysostom prayers are used extensively in the Eastern Byzantine Catholic and Orthodox churches liturgy, showing the respect he garners. Also, St. Basil’s words are used in the Divine Liturgy ten times throughout the year, but most of the year it is St. John’s. His Beatitude Sviatoslav Shevchuk, Major Archbishop of the Ukrainian Greek Catholic Church, meeting with Pope Francis in Rome. In addition to one of the Three Holy Hierarchs in the east, in the west, St. John Chrysostom is among the 33 “Doctors of the Church,” and remembered especially for his extensive and profound teachings on the subject of the Holy Eucharist. 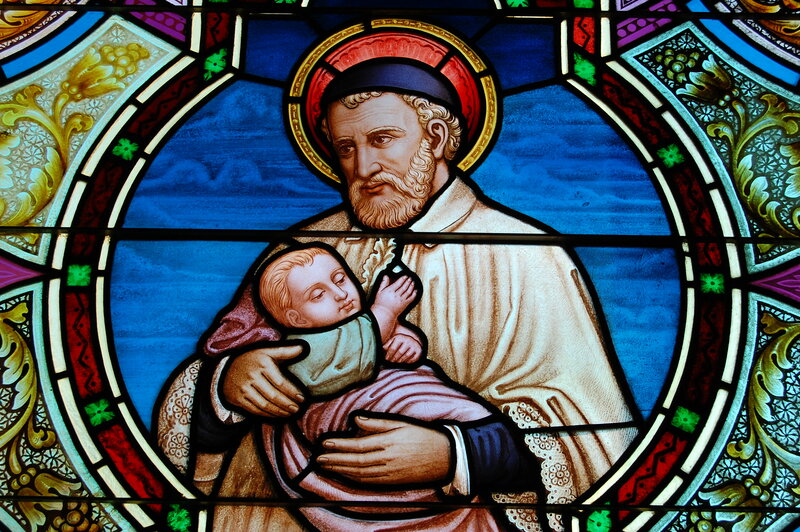 Along with St. Joseph, he was named co-patron of the Second Vatican Council by Pope Saint John XXIII a major event. St. Gregory of Nazianzus, who is called the Theologian, was born in Nazianzus in Cappodocia in 325 A D. He was the Archbishop of Constantinople. Becoming or imitating Christ is the basis for theosis, an Eastern Christian theology concept. Saint Peter wrote in the bible that we are called “to become partakers of the Divine nature.” St Basil also described man as the creature who has received the order to become a god. The Three Holy Hierarchs are the great intercessors for us in Heaven. “Everything drew me to love and thank God: people, trees, plants, and animals. I saw them all as my kinfolk; I found in all of them the magic of the name of Jesus”. The Jesus Prayer relates well to the Jubilee Year of Mercy in 2016. The Three Holy Hierarchs; St. Basil the Great, St. John Chrysostom, St. Gregory the Theologian, are giants in Eastern Christianity. Saint Gregory the Theologian is known for purity and profundity of his language, St. Basil for his understanding of the Holy Spirit and Saint Chrysostom for his elegant homilies. They all lived in the east, near Cappadocia (Turkey) at the same time in the 4th century. All three Eastern Church Fathers have their feast day in January. In the Roman Catholic west, they are Doctors of the Church. An academia priest from Temple University told our congregation that St. Basil created the Glory Be to The Father prayer, one of the most widely said prayers in history. Many people are unaware that Basil created this prayer. Pope Francis has always identified with Basil’s teachings. St. Basil was recently quoted by Pope Francis in the LaudatoSi encyclical,“If the world has a beginning … we must inquire who gave it this beginning, who was its Creator”. Basil wrote On The Holy Spirit, defining the Holy Trinity as One God in Three Persons, a complex theology topic even today. St. John Chrysostom, from inside the Hagia Sophia, Turkey, pictured at right. 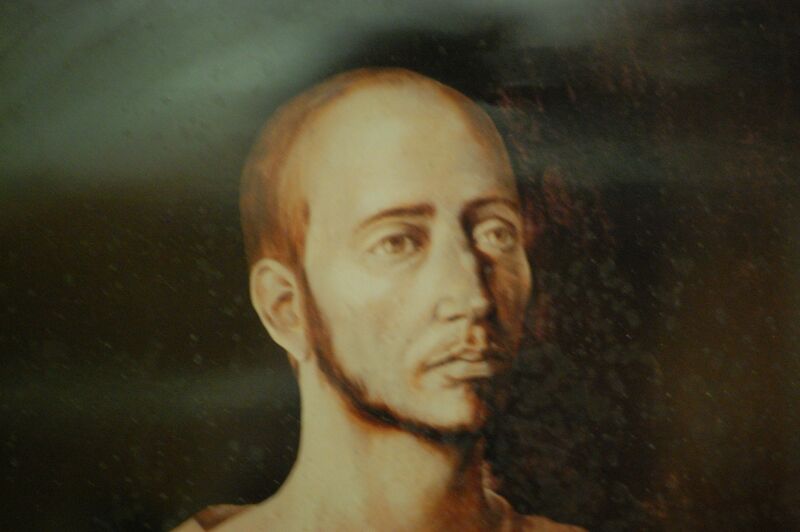 After his baptism at age 30, Gregory the Theologian joined his friend Basil in a newly founded monastery. He and Basil fought Aryanism, which denied the divine nature of Jesus Christ. They also defined the Trinity in their great sermons. The eastern rite Eucharist host is shown above the chalice. The host is square compared to a round host in the Latin Roman Catholic rite. The Eastern Church believes the mystical life is all around us, and asks us to “be attentive” to God’s word. During the Divine Liturgy the religious and faithful say “Be Attentive” as a common prayer phrase into mystical participation cumulating with the Eucharist. The IC XC NIKA is stamped into every prosphoron (loaf of altar bread). The IC XC abbreviation (in both Greek and Slavonic) is the name, “Jesus Christ”. NIKA is a Greek verb that means “conquers”, or more closely related to “is victorious”. St. Irene Chrysovalantou, granted the gift of clairvoyance. She knew thoughts of all she saw. Holy Trinity Chapel. When Byzantine theologians describe the reality of the love of God, they always turn to expressions of admiration, amazement, awe and wonder. To define this love is to limit it. It must remain unlimited, boundless, indefinable, unexplainable. The explainable has only limited value and transient interest. The true is always wondrous. Prayer is the elevation of the intelligence to God, not in order to learn about God but to discover God; not to know about Him but to know Him, to experience God in one’s own life. Ladder of Divine Ascent icon St. Catherine’s Monastery Egypt, 12th century. Monks ascending the ladder to Jesus, led by S. John Climacus. Theosis is the mystery where He makes divinity our own. Theosis describes the spiritual pilgrimage in which each person becomes ever more perfect, ever more holy, ever more united with God. It is not a static relationship, nor does it take place only after death. On the contrary, theosis is a movement of love toward God which begins for each Christian with the rites of Baptism and which continues throughout this life, as well as the life which is to come. Jesus frequently went to Gethsemane with His disciples to pray (John 18:2). Holy Trinity Chapel. Mary with the prophets and Christ Enthroned over the last Supper. Ukrainian Catholic Cathedral of Immaculate Conception in Philadelphia PA. Photo credit: Cathedral of Immaculate Conception. Theotokos or “God bearer” Mary, Mother of God. Basil Center, Jenkintown PA.
Theotokos with child. We see the Holy Virgin as a lamp of living light, shining upon those living in darkness- Mother of God by C. Douchwat. Holy Trinity Chapel. In the Dormition of the Theotokos, Jesus is standing in center with a small child representing the Soul of Mary. Holy Trinity Chapel, Basil Center, Jenkintown PA. 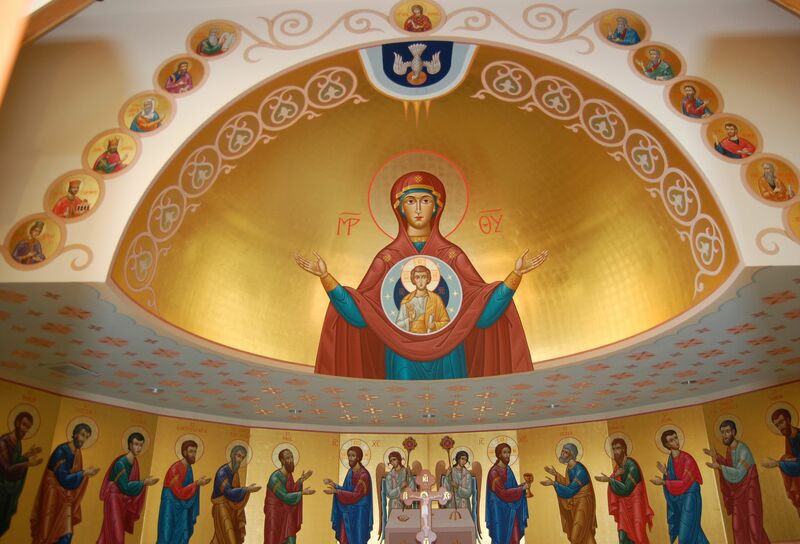 When leaving an Eastern Catholic Church, the Dormition of Mary is usually the last icon viewed. Mother of God Icon at Our Lady of Pochayiv Grotto, Basil Center. Original in Pochayiv Lavra monastery, Ukraine since 1597. On grounds near Holy Trinity Chapel. Our Lady of the Sign. “The Lord will give you a sign. The virgin will be with child and give birth to a son. Is 7:14. Holy Trinity Chapel. Iconography has been used for centuries as a means of communicating theology with the use of images. Especially in the early days of the church, when many could not read, this was extremely beneficial. Christ the Teacher icon. O God, we pray that the whole creation will in all things be restored to your Son, the King of the Universe. Holy Trinity Chapel. 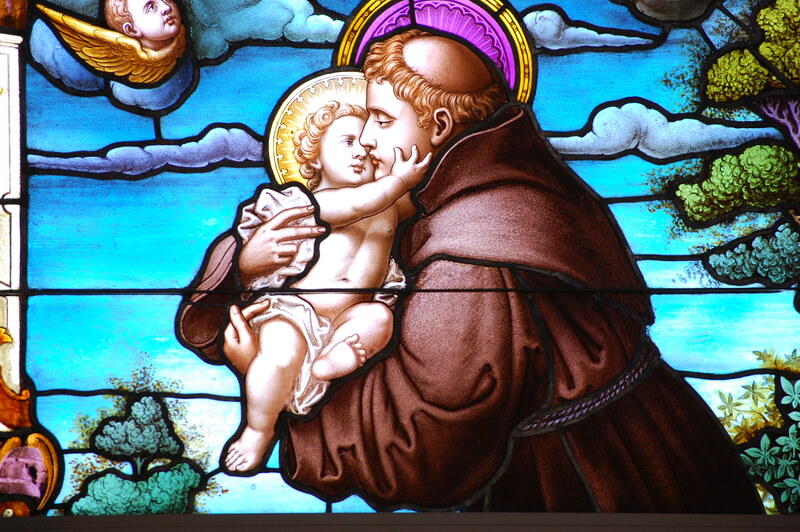 An image, says St. Thomas Aquinas, connotes three simultaneous qualities: likeness to prototype, derivation from it, and similarity of species with it. Likeness alone is not enough … The underlying idea of the icon is the manifestation of the hidden. The Eucharist icon. Jesus with St. Paul. Holy Trinity Chapel. Eucharist icon. Jesus with St. Peter. Holy Trinity Chapel. The Pantocrator, Christ blessing his people with New Testament in left hand. Holy Trinity Chapel. Original Holy Trinity icon written by Russian iconographer Andrei Rublev (b.1360), also called The Hospitality of Abraham and Sarah. One of the most recognizable icons in the world. The three angels portrayed are sharing together at the table. When a circle is superimposed over the icon, Rublev portrays each figure as equal, no one is more important than the other. The persons of the Holy Trinity: the Holy Spirit is on the right, the Son in the middle, and the Father on the left. Macrina the Younger sister of St. Basil. Holy Trinity Chapel. The icon, then, is not only an aesthetical entity. It is the result of the faith and prayer of the Church. It is the life of the Church lived in Christ. A saving truth is not communicated by the word alone but by the fact of awakening vital forces of life, through the presentation of beauty. Because God loved us, He turned to us a visible face, a human face, in Christ. He turned to us the face of the absolute beauty which is not different from the fullness of God and the fullness of being. The icon carries with it the love of this beauty, and the beauty of this love. – from Byzantine Daily Worship by Archbishop Joseph Raya & Baron José de Vinck, Alleluia Press, Allendale, NJ. Adapted for use by Father J. Michael Venditti. Eparchy of Passaic NJ. Pantocrator, “Ruler of All” Christ blessing his people located on ceiling of the Holy Trinity Chapel in Jenkintown, Pennsylvania. “Christ,” says St. Paul, “is the icon of the invisible God” (Col. 2:7). “Old Testament Trinity” Three angels with Abraham and Sarah. Holy Trinity Chapel. 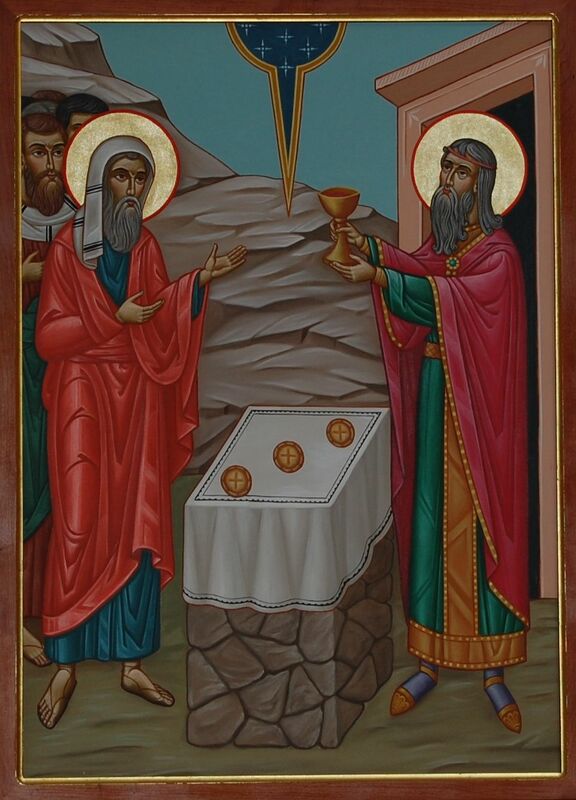 “Old Testament Trinity” icon is based on Genesis 18:1-15. The story is commonly known as the hospitality of Abraham. When Abraham talks to them, they respond as one (“they said”), the one God in three persons: Father, Son and Holy Spirit. Cappadocian Fathers: Basil “the man of action”, Gregory of Nazianzus “the orator” and Gregory of Nyssa “the thinker”. The Pantocrator icon written on ceiling of the Cathedral of Immaculate Conception. Transfiguration Icon. Here You were transfigured in glory on Mount Tabor, O Christ; You showed Your disciples Your glory. Aerial view of the Church of Transfiguration at the summit of Mount Tabor, which is divided into Eastern Orthodox (northeast) and Roman Catholic (southeast) areas. Eastern christian architecture at St. Michael the Archangel Ukrainian Catholic Church in Baltimore Md. 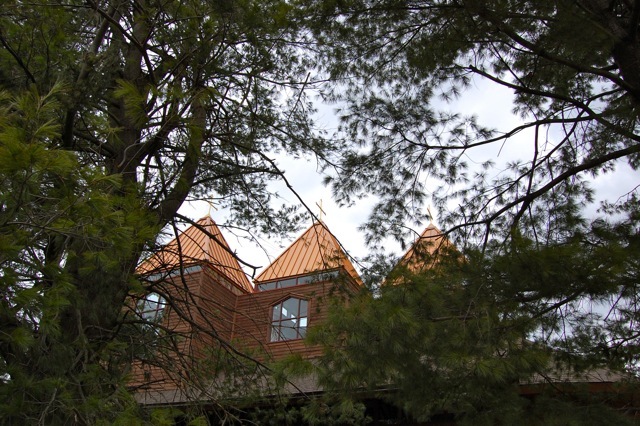 is easily recognizable with its multiple onion domes. Details of an Eastern Orthodox Church. Note the Templon is also called the Iconostasis. The Narthex or entrance to the church symbolizes this world, the nave or pews represents the Church. Across the front of the church is the Iconostasis wall that separates the nave or pews from the sanctuary or altar, which symbolizes the Kingdom of God on Earth. No layman is permitted inside the Sanctuary. Narthex. Ukrainian Catholic Cathedral of Immaculate Conception, Philadelphia PA. 11/15 Eastern Catholic Church in the Ukrainian Byzantine rite. On the Holy Table in the Sanctuary are placed the Book of Gospels and the Holy Gifts during the Divine Liturgy, and in the center of the table stands the tabernacle (artopohorion) containing the reserved Eucharist. The cupola or inside the dome symbolizes the sky and in an Orthodox tradition, at the top, inside the dome, is Christ the Pantocrator, the Ruler of All. Depicted below him, around the dome, are the central act of worship, the Divine Liturgy; the Twelve Apostles; and major prophets and other figures of the Old Testament. Iconostatis at Ukrainian Catholic Cathedral of Immaculate Conception, Philadelphia PA. The central doors or Royal Doors of the iconostatis are shown open. The Iconostatis represents the natural boundary between God and man; earth and Heaven. The closed Royal Doors of the Cathedral of Immaculate Conception showing the gospel writers flanked by Jesus on the right and Mary with the child Jesus on the left. Only religious walk through these doors. More on the Iconostasis: Next to Mary, the shorter icon is Archangel Michael one one of the side doors or deacon doors. On the far left is St. Nicholas. Next to the Jesus icon, is also a deacon door shown as St. Stephen and on the far right is St. John the Baptist. Above are the Great feasts of the Church and the round icons atop the iconostasis are the Old Testament Prophets. The apostles are the rectangular icons. At the center top are the icons of Last Supper and Christ Enthroned. The Divine Liturgy of St. John Chrysostom is the one most commonly celebrated liturgies throughout the year. The longer Liturgy of St. Basil the Great is celebrated ten times a year. His Beatitude Sviatoslav Shevchuk at the Ukrainian Catholic Cathedral of the Immaculate Conception, Philadelphia, PA celebrating Divine Liturgy on November 15, 2015. He is the Major Archbishop of the Ukrainian Greek Catholic Church. Photo: Cathedral of Immaculate Conception. Inside the sanctuary located behind an icon screen, represents Heaven, the dwelling place of God. As shown, the Royal Doors are open showing the altar and tabernacle inside the sanctuary. Note His Beatitude is talking outside the sanctuary, closest to the congregation (representing earth). Holy Archangel Michael Byzantine Catholic Church, Mount Claire PA. In communion with the Bishop of Rome (the Pope). Byzantine Catholic Eparchy of Passaic, NJ. Photo credit: Holy Archangel Michael Byzantine Church. Most of the Eastern Catholic parishes on the east coast of the United States are small parishes with 400-500 parishioners, yet closely knit, vibrant and conveniently located in towns of all sizes. Holy Archangel Michael Byzantine Catholic Church is one of these churches. There are roughly 37 parishes in the Pennsylvania area of the Ruthenian Byzantine Catholic Church and close to 40 parishes in Pennsylvania and New Jersey within the Ukrainian Catholic Archeparchy of Philadelphia. Catholic priests with bi-ritual faculties, can celebrate the Holy Eucharist in two different traditions: the Divine Liturgy in the Eastern Catholic Byzantine tradition and the Mass in the Latin tradition. Fr. Mitch Pacwa of EWTN is bi-ritual and Fr. James Badeaux pastor at Holy Archangel Michael Byzantine Church above also has bi-ritual faculties. There is a healing liturgy at Holy Archangel Michael Byzantine Catholic Church that has been effective, from first hand accounts, of healings; from divine gifts received that place an ailment into remission; to miracles for a complete cure. Communion served in Eastern rite tradition. When receiving the Eucharist in an Eastern Catholic Ruthenian Church, the priest will say your name, and if he doesn’t know it, he will ask your name. The Eucharist is served on a communion spoon. Photo credit: Cathedral of Immaculate Conception. “I think what people find is a very rich liturgy that’s very focused on the mystical dimension of the Eucharist.” – Father Kevin Kennedy, pastor of Our Lady of Fatima Russian Catholic Church, San Francisco CA. “Truly, I say to you, unless you eat the flesh of the Son of Man and drink his blood, you have no life in you” – Jesus (John 6:53). Altar in sanctuary at Holy Trinity Chapel surrounded by Jesus, two Archangels and the Apostles. The Resurrection Icon. Pascha or Easter is the most important feast in the Byzantine liturgical year. It celebrates the resurrection of our Lord and his victory over the power of death. Note: Behind Christ is written: IC XC (Jesus Christ). Holy Trinity Chapel. St. Andrew (left) was the first called of the Apostles and brother of Peter and plays an important part in the Byzantine Catholic Church. Saint Andrew is the patron saint of Russia, Ukraine and Scotland. St. Andrew evangelized the region known as Byzantium. Brothers Saints Cyril and Methodius (rt), “Apostles to the Slavs” (Ukrainian) are the Patron Saints of Europe and play an important part in the founding of the Eastern Byzantine Church. The followers of these Byzantine Greek missionaries converted the Ruthenian people, creating the modern day Ruthenian Byzantine Catholic Church. There are many eastern saints, some with their feast days are shown in calendar here. Eastern Orthodox and Eastern Catholics place great emphasis on the sign of the Cross. The Eastern Catholics make the sign of the Cross in the same way as the Orthodox, forehead to chest, then from right to left, with the thumb, index and middle fingers joined in honor of the Trinity. The other two fingers are pressed to the palm, in honor of Christ’s two natures, divine and human, in one Person. In most parishes, no one will kneel during the sanctification of the gifts. There are other parishes where some will kneel and some will stand. Some parishes have no kneelers in the pews at all. This could be based on the first Christians who stood in the great churches of the time and would read the icons since many did not read or write. St. Nicholas of Myra (left) or Holy Father Nicholas plays a prominent role in Eastern Christianity from the Latin Rites. The famous Icon of the Nativity (right) showing Christ born into a stone coffin, a sarcophagus, a symbol of His death. His mother is lying next to him, dressed in red. In some Eastern Churches, Christmas is celebrated on January 7th instead of December 25th. This is because Byzantine Catholic churches follow the Julian calendar in which Christmas falls 13 days after that of the Gregorian calendar. The Old Testament prophets play a special role in Eastern Christianity. Their books are read and icons viewed as a critical voice to listeners. Icons share a mystical look into the soul of a prophet. Prophetess Anna, a seer, speaking with foreknowledge on God’s behalf. “She joyfully told of the child” – Luke. She was very old and spent all her time worshiping God by fasting and praying at the temple. Holy Trinity Chapel. “Kings of distant lands will come” Psalms 72. King David prophesied foreign kings bringing gifts to the Messiah. #prophet Holy Trinity Chapel. “A Star Will Come out of Bethlehem” – Numbers 24:17 #ProphetMoses predicts where the Messiah will be born. Holy Trinity Chapel. St. John the Baptist icon created by The Monks of Tabor, California. He laid his hands upon Him as the prophets foretold, showing himself to be the forerunner of the Word of God. Mondays dedicated to Angels and Archangels. Archangel Michael, Holy Trinity Chapel. Archangel Michael: O leader of the heavenly armies, we beseech you to encircle us with your protection. Mondays dedicated to Angels and Archangels. Archangel Gabriel at Holy Trinity Chapel. Archangel Gabriel, watch over us as we bow low, deliver us from trouble, O Prince of the Heavenly Armies. Pope Francis in Philadelphia 2015. St. Peters Dome designed by Michaelangelo. Eastern Catholics are in union with the Pope in Rome. They share with Roman Catholics the same basic faith and the same mysteries (sacraments) and adhere to the Creed, although the Divine Liturgy follows many of the traditions of the Orthodox churches. Archbishop Sviatoslav Shevchuk, head of the Ukrainian Greek Catholic Church in communion with Rome. His Beatitude Sviatoslav Shevchuk on left with the mitre of Eastern Byzantine bishop flanked on left by Archbishop Stefan Soroka of the Ukrainian Catholic Archeparchy of Philadelphia. Auxiliary Bishop Most Reverend John J. McIntyre is in background with the white mitre of the Roman Catholic Auxiliary Bishop. New Church Bell Tower blessing, November 2015. Photo credit: Cathedral of Immaculate Conception. The Eastern Catholic door is open to all Roman Catholics as a means to get closer to God. The Divine Liturgy in the Eastern Catholic rites is accepted by Rome and the Pope for Sunday obligation and encourage by Pope Francis. Photo credit: Cathedral of Immaculate Conception in Philadelphia, Pennsylvania. Incense and music are used throughout an Eastern Christian liturgy service. The epistle reading are sung usually by a cantor from the congregation. The priest can sing the gospel and many parts of the Divine Liturgy. Byzantine Chant from St. Andrew, Kontakion the Great Canon (in English) by Fr. Apostolos Hill. St. Andrew was born in the Syrian city of Damascus. Fasting is an important discipline in the Christian East. Major portions of the Liturgical cycle are taken up by periods of fasting. In the Byzantine tradition observed by Greek Catholics or Byzantine Catholics (and Orthodox Christians) the Great Lent also known as the Great Fast is a major fast lasting for 40 days. Pope Francis hopes to reunite the Roman Catholic Church with the Eastern Orthodox Church and is seen here with Archbishop of Constantinople, Patriarch Bartholomew in Rome. There is a separate dialogue between Pope Francis and the six Oriental Orthodox Churches of the Coptic, Armenian, Syriac, Indian, Ethiopian, and Eritrean tradition. These churches did not accept the council of Chalcedon in 5th century that professed Jesus was one person with two natures, a human and divine. Russian Orthodox leaders still routinely exude hostility. They insist that Eastern Catholic churches, which follow Orthodox traditions but are in communion with the pope, are a Trojan horse to siphon off their faithful. They complain about Catholic encroachment on their “canonical territory” in Ukraine, Belarus, and Russia, although they show no inhibitions about opening up shop in Western Europe and Latin America. …Roughly half the members of the Russian Orthodox Church are in Ukraine, and if they break away, it would be a major political and financial blow for Moscow. Many Ukrainians recall the way criticism of the Soviets was stifled in Rome for decades as part of a policy of Ostpolitik, and, to be frank, some see Friday’s joint declaration as cut from the same cloth. Likewise, Saint Pope John Paul II urged that the Catholic Church “breathe with two lungs” — East and West alike — rather than with only one Western, or Latin, lung. He underscored his point in 1985 by naming Saints Cyril and Methodius, whose feast day is celebrated Feb. 14, as co-patrons of Europe alongside St. Benedict of Nursia. “The goal would be that we could all be celebrating the same Eucharist together and commemorating the pope in Rome and all of the Orthodox vanguards and Catholic bishops together and that we could be what we were for the first thousand years in the history of Christianity, an undivided faith. Different, but in communion with each other” – Fr Kennedy Our Lady of Fatima Russian Catholic Church, San Francisco CA. When Pope John Paul II met the Catholic Bishops of Ukraine in the year 2001, he used the analogy of two lungs in the human body to represent the Western and Eastern elements of Christianity. Using Pope John Paul II’s analogy, the left lung represents the Latin Rite, and the right lung represents the Eastern Churches. (Note: The Eastern Churches include all of the Eastern Rites in union with Rome, and the separated Orthodox Churches.) Since the Great Schism of 1054, the separation of the Orthodox Churches from Rome has made the Mystical Body of Christ (the Church) breath with one lung for many centuries, instead of two. – Nicholas Kovacs, O.F.S. Ukrainian Martyrs: thousands of Eastern Catholics perished under communist rule 1918-1980 from The Treasury of Faith Museum, Philadelphia PA.
Russian rebel occupation in 2014 of Eastern Ukraine and hostilities resulting in 9,500 deaths and 20,000 injuries, as of this writing. It affects Ukraine’s roughly 6 million Ukrainian Greek Catholics and also those in Orthodox Church. Eastern Christianity consists of four main church families: (a) the Eastern Orthodox Church, which recognize the Patriarch of Constantinople; (b) the Oriental Orthodox churches; (c) the Assyrian Church of the East; and (d) the Eastern Catholic churches, which are in communion with the Church of Rome and the Pope. The churches in Rome and Constantinople separated in an event known as the East–West Schism of 1054. In Rome, the church became the Roman Catholic Church (red line) and in Constantinople the church became the Eastern Orthodox Church (blue line). 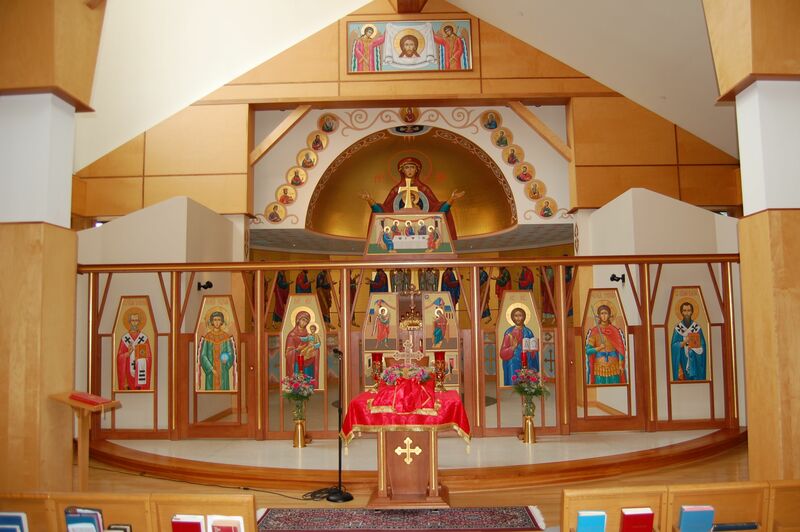 Christians of the Eastern Churches call themselves Orthodox, examples are the Greek Orthodox Archdiocese in America, the Russian Orthodox Church and the Greek Orthodox Church of Constatinople. They are not in communion with Rome. While Eastern Orthodox Christians have much in common with Eastern Catholics, they’re still in schism, split off from the Pope and therefore not Catholic. Each Orthodox Church has a bishop, with a territory over which he governs. There is no central command like a pope. The Assyrians and Orientals left the Orthodox Church in the years following the Council of Ephesus (431) and the Council of Chalcedon (451), in their refusal to accept those councils’ Christological definitions, which were based on St. Basil’s discovery and writings. Headquarters in Erbil in Northern Iraq. Within Eastern Christianity are the Eastern Catholics that have their roots in the Orthodox East, with twenty three Eastern Churches in communion with Rome. They are autonomous self governing Eastern Catholic Churches. As an example, the Byzantine Catholic tradition is one of these and includes the Ukrainian Catholic Archeparchy of Philadelphia as early shown. Byzantine Catholic Churches include Ukrainian, Ruthenians, Melkites, Coptics and others. The Byzantine Ukrainian rite, the largest of the eastern catholic churches has 4.5 million members or 26% of all Eastern Catholics. The Pantocrator “Ruler of All” Christ blessing his people with New Testament in left hand, seated on a holy chair in the Cathedral of the Immaculate Conception. 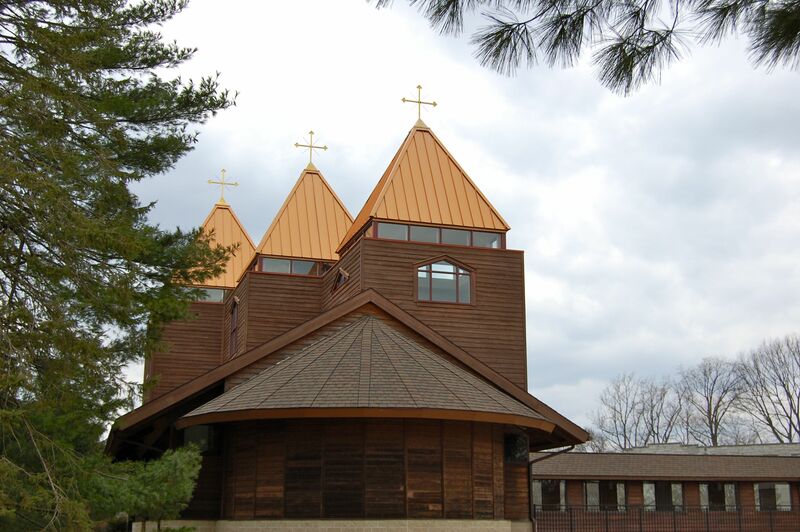 Located in Fox Chase Manor, Pennsylvania, a suburb of Philadelphia, the Basilian Spirituality Center is part of the Eastern Byzantine Ukrainian Catholic Church, under the umbrella of the Ukrainian Greek Catholic Archeparchy of Philadelphia. The Basilian Family at the Basilian Spirituality Center. Icons play a significant role in the Eastern Byzantine rite. The “Basilian Family” icon, located on a wall within the retreat center is especially core to the Sisters of the Order of St. Basil the Great. Central in the Basilian Family is Mary, her arms outstretched and the name of her Son, “IXC”, radiating from her body. In Eastern Byzantine rite this is called The Theotokos, Mary Mother of God. Macrina The Elder is to the right of Mary, to whom St. Basil attributed much of his spiritual formation. She is dressed in green, the symbol of the Holy Spirit, a woman of spiritual gifts and the wisdom of God. 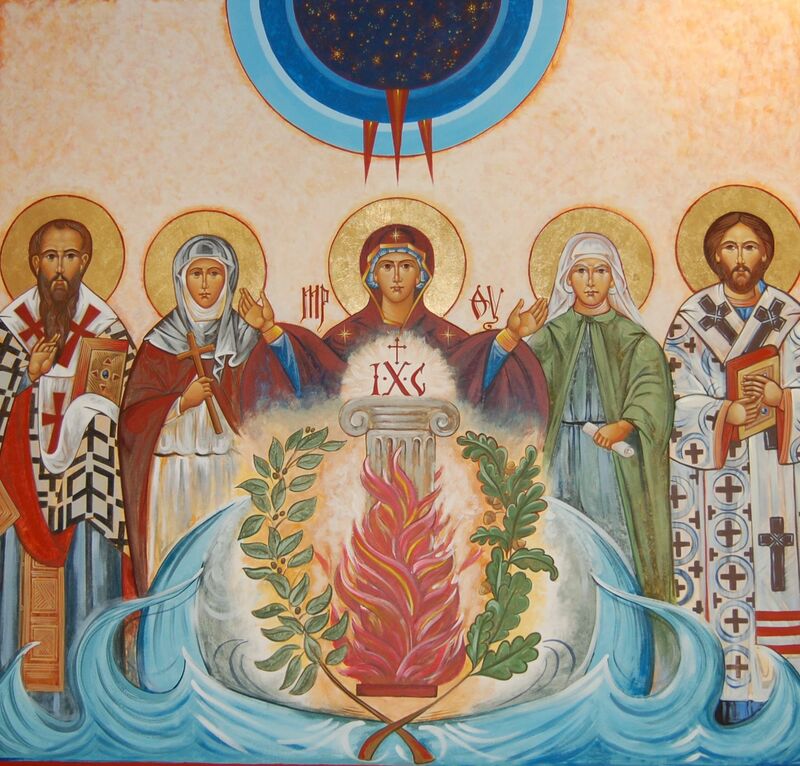 To the right of Macrina the Elder is St. Gregory of Nyssa, brother of St. Basil, holding the gospels as a symbol of his preaching abilities and is dressed in the ecclesiastical garb of a Bishop. To the left of The Theotokos is Macrina the Younger, Basil’s sister, in monastic garb as a foundress of the community of Neocaesarea and next to her is St. Basil also dressed as a Bishop carrying the gospel. Holy Trinity Chapel. The Solemnity of the Holy Trinity was celebrated here on June 15th. The Byzantine rite is one of several Eastern rites recognized in full communion with the Bishop of Rome; Pope Francis. Its origin can be traced to the ancient city of Byzantium (modern-day Istanbul), renamed Constantinople when the emperor Constantine relocated his capital city there from Rome in A.D. 330. On the rear wall of the Holy Trinity Chapel, the Chapel of the Sisters of the Order of Saint Basil the Great, is the “Theotokos” icon, meaning “God Bearer” or ‘Mother of God’. Mary is the Theotokos, the one who gave birth to God. This was the Council of Ephesus (in 431) and the Council of Nicea’s definition of Mary since Jesus was true God and true Man, so Mary could be called “Mother of God”. It appeared in the Archbasilicas of Rome, built by Constantine in one of the first churches ever built. The Eastern Ukrainian Byzantine Church has 5.5 million followers. 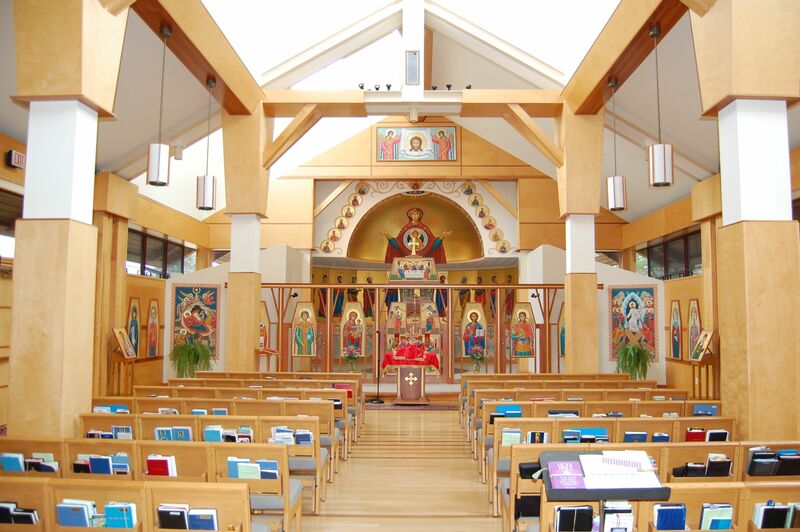 Typically the sanctuary is separated from the congregation by an iconostasis, a screen covered with icons. Leavened bread is used for the consecration of the body of Christ in the liturgy (not called the “Mass” in Eastern rites), which is either the liturgy of St. John Chrysostom or that of St. Basil the Great. Communion is received under both kinds and administered by the priest using a spoon to the faithful. Located on the ceiling in the nave of the Chapel is the Pantocrator Icon, “Ruler of All”, Christ blessing his people. The Pantocrator is present in most Eastern Byzantine churches along with the Theotokos described earlier. Byzantine Catholics operate under a different code of canon law. They also celebrate a somewhat different liturgical year with some unique feasts and saints. Latin-rite Catholics can attend a Byzantine liturgy to fulfill their obligation to attend Mass. Two at the Tomb icon. 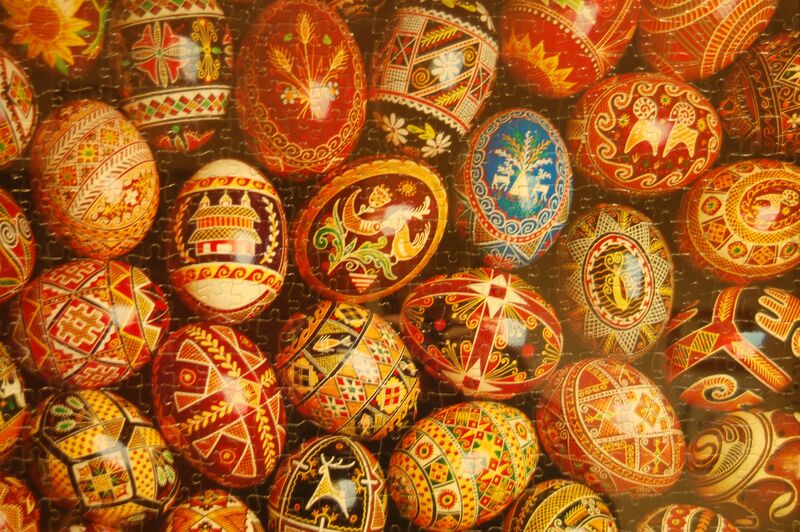 Pysanky eggs photo on display at the Basilian Spirituality Center. 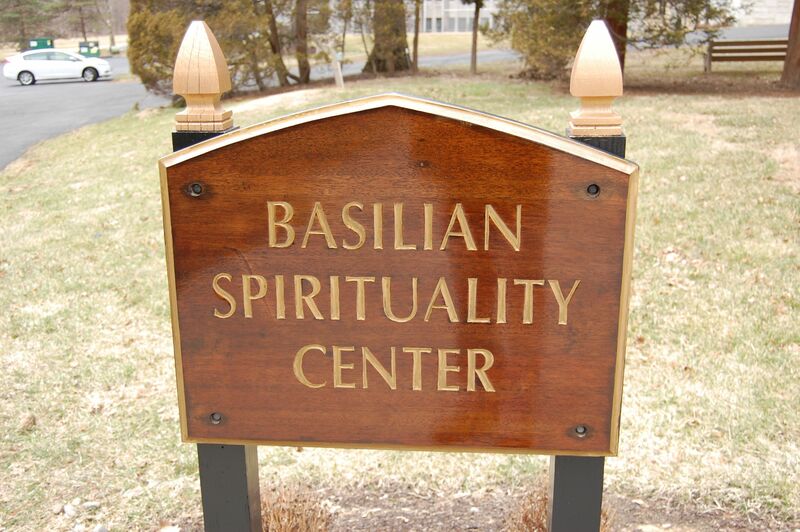 Entrance to the Basilian Spirituality Center complex. Each year an icon presentation and icon writing workshops are held at the Basilian Spirituality Center in Philadelphia Pennsylvania. This year (2014), famed iconographer Rev. Damian Higgins conducted the icon workshop. Rev Damien is from the Holy Transfiguration Monastery also known as Mt. Tabor Monastery in Redwood Valley, California. 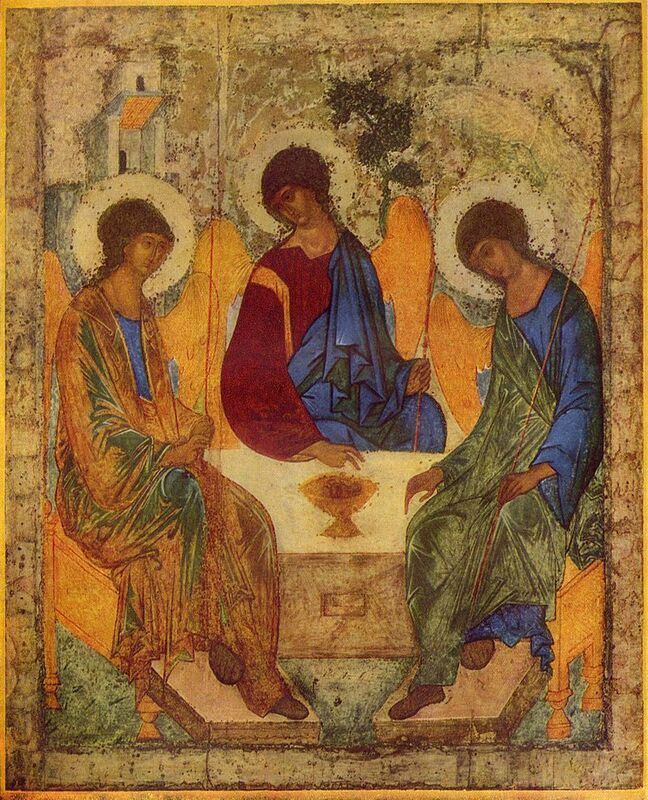 One of the all time famous icons every created, “The Holy Trinity” by Russian iconographer Andrei Rublev (1360-1370). Symbolism in the three spires on Holy Trinity Sunday. St. Basil the Great, a doctor of the Church. The Georgian iconographer, Niki Chocheli from the former Soviet Republic, enlarged the saints forehead, portraying the expanded mindset of Basil.